Over the past year, Sosa Cigars has been celebrating 50 years in the cigar business. While there have been releases such as the Sosa Half Century and Sosa 50th to commemorate this occasion, parent company Antillian Cigar Company has also decided to re-launch its Imperio Cubano line as a part of the celebration. The Imperio Cubano returns with two all new blends in both a natural and maduro offering. As a part of this re-launch, production of the Imperio Cubano is being moved (back) to Miami, Florida. The revamped line is now known as Imperio Cubano Miami. Recently I’ve had an opportunity to smoke the Imperio Cubano Natural blend in the Robusto size. Overall I found this to be an impressive cigar and one definitely worth keeping an eye on. For the new Imperio Cubano Miami line, Arby Sosa who is currently running the day to day operations of Antillian Cigar Corporation has teamed up with master blender Santiago Cabana. Both Sosa and Cabana spent about six months working to re-create the blends for the Imperio Cubano. Both the Maduro and Natural blends are intended to be small batch and are targeted to only 50 to 75 shops. In terms of the original Imperio Cubano, it was originally launched in Miami back in the 1990s. When Arby’s father Juan B. Sosa went to work for Arturo Fuente, production moved to the Dominican Republic. By 2000, production of the Imperio Cubano line became small batch for select retailers. Antillian Cigar Corp has said that production of the Cameroon blend from that line will continue in the Dominican Republic. That cigar is being rebranded Imperio Cubano Cameroon and will be made exclusively for McLean Cigars in Virginia. 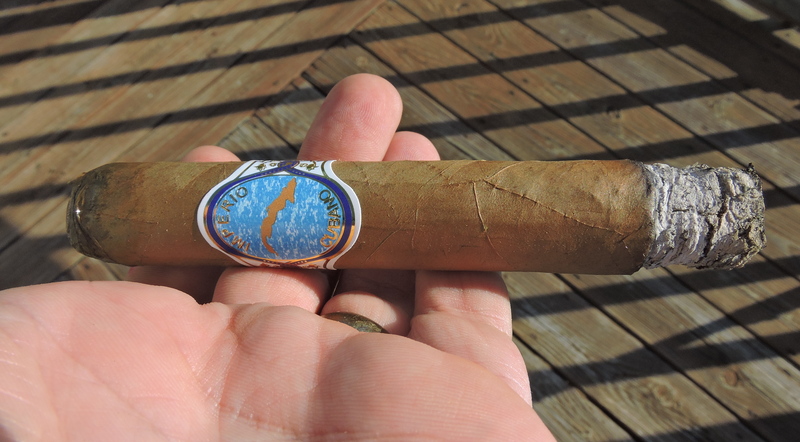 Several weeks ago, we took a look at the Imperio Cubano Miami Maduro. We now take a closer look at the Imperio Cubano Miami Natural and see what this cigar brings to the table. The Imperio Cubano Miami Natural consists of a four country multi-national blend. 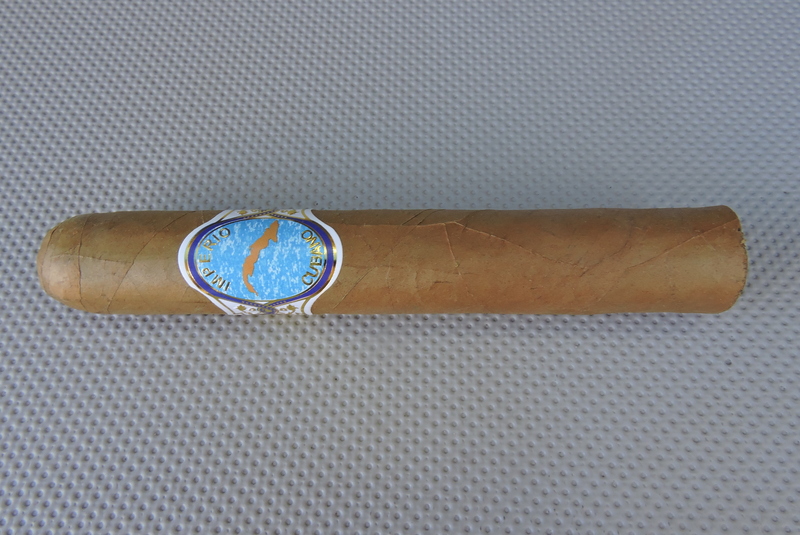 The cigar uses a Ecuadorian Connecticut wrapper. The Imperio Cubano Miami Natural is offered in three sizes. Each size is offered in 20 count boxes. This particular Ecuadorian Connecticut wrapper of the Imperio Cubano Miami is darker than most wrappers of this origin. The wrapper has almost a light caramel type of color. The wrapper also has a nice oily sheen to it with some visible veins on the surface. There are also some visible wrapper seams, but they are on the thin side. Overall, I did consider the Imperio Cubano Miami Natural Robusto to be a cigar on the smooth side. I also found this to be a well-packed cigar. The bands on both the Imperio Miami Maduro and Natural are identical. The front of the band features an oval field with a bright blue sea water design. On the center of the map is an orange colored image of the island of Cuba. On the upper part of the oval is the text “IMPERIO” in gold font arranged in a curved fashion. On the lower part of the oval is the text “CUBANO” – also in gold font arranged in a curved fashion. The oval field also has gold trim around it. The remainder of the band is white in color with gold adornments. Two of the gold adornments are medallions that are on the left and right side of the band respectively. Prior to lighting up my Imperio Cubano Miami Natural Robusto, I went with a straight cut to remove the cap. Once the cap was removed, I proceeded with the pre-light draw phase. The dry draw delivered notes of cream, sweet natural tobacco, and a very subtle spice I could not put my finger on. Overall I was quite pleased with the pre-light draw of the Imperio Cubano Miami Natural. At this point I was ready to light up this cigar and see what the smoking phase would have in store. The Imperio Cubano Miami Natural Robusto started out with more of the natural tobacco sweetness I got from the pre-light draw. I also detected some notes of cream, grass, and a slight pepper note in the background. Meanwhile the retro-hale produced a cedar sweet-spice through the nasal passages. As the Imperio Cubano Miami Natural burned through the first half, I found the cream component became the dominant note. Meanwhile in the background, the natural tobacco continued to deliver sweetness. The grass and pepper notes had fused nicely creating an herbal spice. By the midway point, the cream notes were still in control, but the herbal spice began to increase. As the Imperio Cubano Miami Natural moved into the final third, the herbal spice became the primary note. Meanwhile the cream and sweetness remained in the background. This is the way the smoking experience of the Imperio Cubano Miami Natural closed out. The resulting nub was firm to the touch and cool in temperature. The burn of the Imperio Cubano Miami Natural Robusto performed very well. I found this cigar to take a straight burn path from start tot finish. There was a slight amount of jaggedness on the actual burn line, but this was more cosmetic and was easily remedied with a few quick touch-ups. The resulting ash had a salt and pepper color. The ash itself leaned more toward the firmer side and came off the cigar in nice clean chunks. Meanwhile the burn rate and burn temperature were ideal. The draw performed well. The draw is what I considered to be open, but not loose. This did surprise me a bit because the cigar seemed to have a nice pack to it when held my hand. In the end, this was not a high maintenance cigar to puff on. From a strength perspective, I found this cigar to pretty much stay in the mild to medium range from start to finish. Toward the last third, I found the strength increased just enough to put this into medium strength territory. As for the body, this kept pace with the strength. I found this to be mild to medium-bodied for the first two thirds, and medium-bodied during the final third. Both the strength and body had an excellent balance throughout the smoking experience. Back in July when I took a look at the Imperio Cubano Maduro, I was quite impressed. In terms of the Imperio Cubano Natural, I was even more impressed. The creaminess of this cigar combined very nicely with the herbal spice and natural tobacco sweetness. This is a great cigar for the novice cigar enthusiast. I’d also say this is an excellent offering for those experienced cigar enthusiasts looking for something on the milder side. As for myself, this is a milder offering that I can easily see myself smoking again – as well as making a box purchase of.